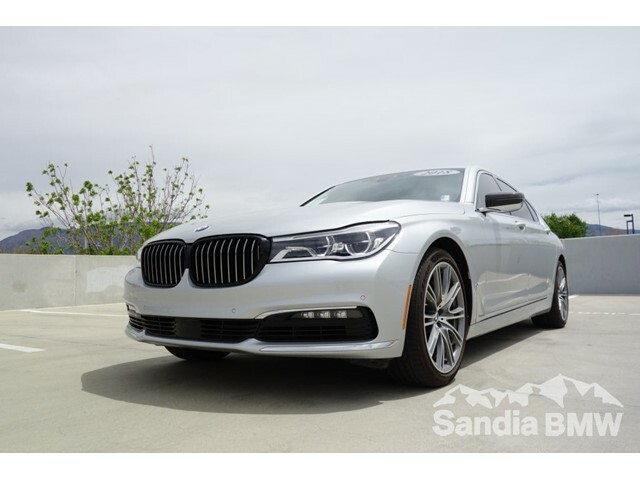 Glacier Silver Metallic 2018 BMW 7 Series 750i RWD 8-Speed Automatic 4.4L V8 32V Twin Turbocharged Sandia BMW MINI is offering this 2018 BMW 7 Series 750i, Adaptive Full LED Lights, LED Fog Lights, Wireless Charging, WiFi Hotspot, 7' Touch Command Tablet, 4.4L V8 32V Twin Turbocharged, 8-Speed Automatic, Glacier Silver Metallic, Cognac w/Nappa Leather Upholstery, 7' Touch Command Tablet, Active Blind Spot Detection, Active Cruise Control w/Stop Go, Active Driving Assistant, Active Driving Assistant Plus, Active Lane Keeping Assistant, Ceramic Controls, Daytime Pedestrian Protection, Driver Assistance Package, Driver Assistance Plus Package, Executive Package, Front Massaging Seats, Front Ventilated Seats, Frontal Collision Warning, harman/kardon Surround Sound System, Heated Steering Wheel w/Fr Rr Seats Armrests, Instrument Panel w/Nappa Leather Finish, Luxury Rear Seating Package, Navigation System, Power Rear Sunshade Rear Side Window Shades, Rear Comfort Seats, Rear Massaging Seats, Rear Ventilated Seats, Speed Limit Info, Traffic Jam Assistant. Recent Arrival! Located in Albuquerque NM, and serving Rio Rancho, Las Cruces, Farmington, and Durango.